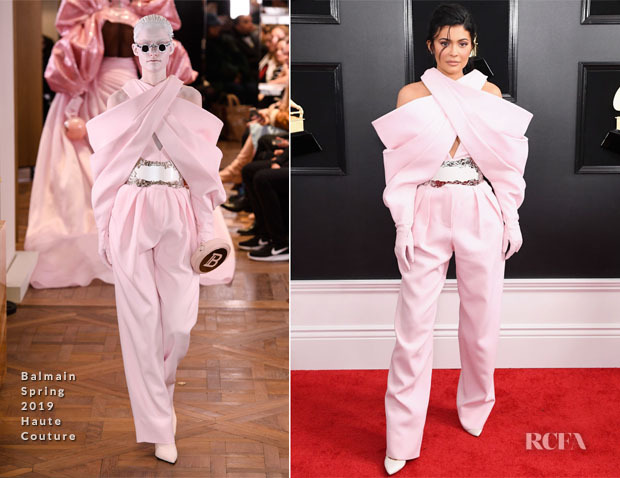 Kylie Jenner attended the 2019 Grammy Awards on Sunday (February 10) in L.A.
Like Katy Perry, Kylie was also in the Balmain army tonight with her look that also hailed from the Spring 2019 Haute Couture collection which you might recall was on the Wish List for Ruby Rose. The fantasy of exaggerated silhouettes and unexpected angles took the form of a re-imagined ‘80s power suit in her look. I love the lighthearted drama of this experimental ensemble on Kylie, as she opts for something different than the familiar skin-is-in sexiness. She brings a youthful rebellion to the pleated folds of the pretty-pastel pink tailoring and built-in gloves. Jimmy Choo ‘Romy’ white pumps and Lorraine Schwartz jewels completed her look.